RainSaucer - No salsa with your tamales? No salsa with your tamales? OK, so you are probably wondering what salsa has to do with tamales. Both are Mexican mainstays but one is made from cheap corn while the other from expensive tomatoes. And that's exactly the point. Farmers, especially those in the developing world, are often limited to raising drought tolerant dry crops such as corn because they have no regular source of water. They cannot farm tomatoes or other "wet" crops because such plants won't survive the irregularity of rain- they need a consistent source of water such as an onsite well or pond which are both expensive to build and pump from. So their incomes remain limited as they must live off of corn production instead of tomatoes. Urban Farmers in the US also face this problem when their city water is considered too "hard" for real farming. Also known as SPIN (small plot intensive farming) farmers, SPIN practioners sometimes have to invest $1000s in filtration equipment and keep replacing filters each year to treat their municipal water and make it agriculture grade. Rainwater is the perfect low cost alternative, if only it was not so irregular. But what if rainwater was available on-demand, right on site, no pumping required? Would it be possible to then grow tomatoes with nothing more than dirt, fertilizer, and a rain barrel? 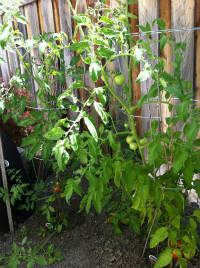 The answer, as we found out this past Summer during our drought resistant tomato crop experiment, is happily "yes". 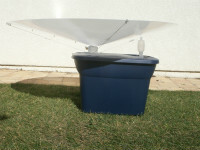 The setup of our experiment was straightforward: 2 tomato plants (see picture above left) were exclusively hand-watered from one 18 gallon tote box (see picture right) with one of our standard 48" RainSaucers™ on board. We started harvesting rainwater in January and by the time we planted in mid-April, we had a full barrel ready to go. 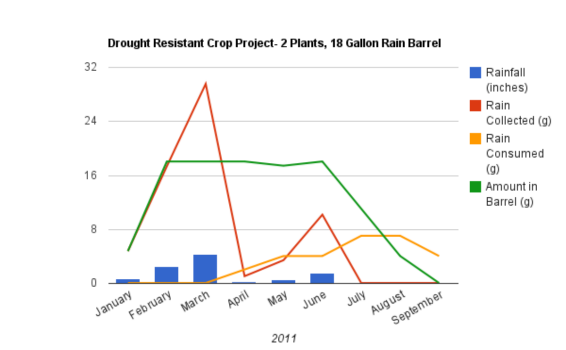 Then thanks to rain in March, April, May and June, our drawdown was minimized while our barrel kept getting topped off. As expected things started getting interesting in July and August when there was absolutely no rain (which happens every Summer in California.) As the temperature increased, we had to increase the amount of watering, averaging almost a gallon per plant per week during those Summer months. But we were still able to make it to September 15th when we harvested our last tomato. Our total yield: about 4 pounds per plant, not great but not any worse than our control tomato plant which also yielded 4 pounds. The taste was also no different- succulent and sweet like a homegrown tomato should be. The below chart provides the data from our experiment showing how we effectively made 2 tomato plants drought resistant during 11 weeks without rain. Now imagine if we used a 55 gallon drum combined with drip irrigation instead of hand watering. Also what if we did this on the East Coast of the U.S. where bad droughts may only be 4 weeks? Based on the results of our experiment, we estimate a 55 gallon rain barrel with three 48" RainSaucers hooked up to a high efficiency, low cost drip system like one from Driptech could support up to 30 plants. Estimated cost: $200, which could probably be recovered in one season of tomatoes as those 30 plants bring in 3 to 5 times more money than the corn equivalent. The payback would be even faster for SPIN farmers who may be able forgo water treatment altogether.